Stir together marinade: ⅓ cup maple syrup, ¼ cup soy sauce, 1 Tbsp sesame oil, 2 pressed garlic cloves, and ½ tsp pepper (you can even combine it in the plastic bag to save a dish!). In a large zip-loc bag, combine salmon fillets with marinade and toss to combine. Seal the bag, removing excess air. Marinate in the refrigerator 45 minutes. Flipping the bag over halfway. Preheat Grill to medium/high heat. Remove salmon to a platter, reserving marinade. Oil the grates (dip a paper towel in oil and use tongs and an oven mitt for safety). Grill salmon skin-side-down over medium/high heat according to the chart below (this salmon took about 4 min per side). 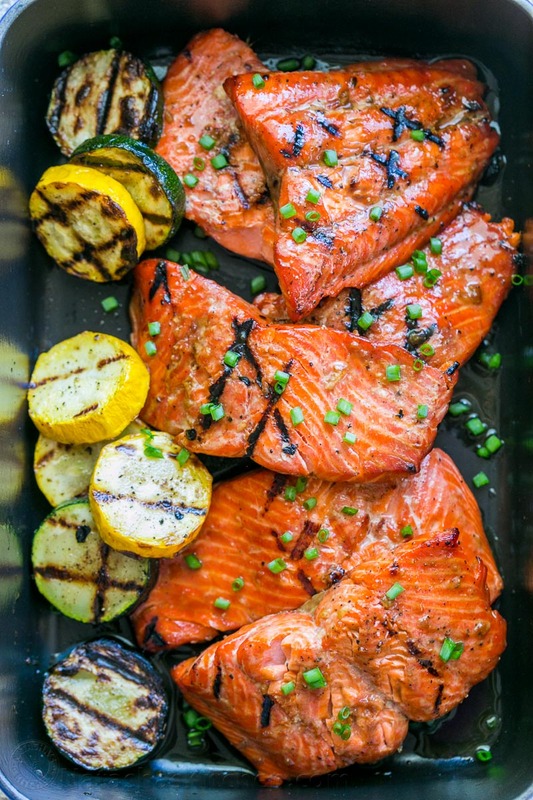 Carefully flip salmon over and continue grilling until salmon is flaky. Transfer reserved marinade to a small sauce pan and boil it down over high heat whisking constantly for for 3-4 minutes, or until starting to thicken. Brush grilled salmon with soy-maple glaze and serve garnished with green onion if desired.